NFBC members only ride. Non-members may try 3 NFBC rides before joining. You must sign the ride waiver to participate in the ride and to earn club points and mileage. There will be a Safety Briefing Meeting 10 minutes before the start of the ride. Please arrive at the starting point early enough to get set up before the pre-ride meeting. Helmets are required on all NFBC rides. This A/B/C+ ride starts at the Publix parking lot in the Murabella Shopping Center close to the entrance of World Golf Village. Choose to challenge yourself in a pace line varying from 19-23 MPH or enjoy the scenery at a B pace as you ride through St. Johns County, along the St. Johns River to Buddy Boys and back to World Golf Village. Other optional stops are Riverdale Park and Molasses Junction. Contact RideDirector@nfbc.us for more information. RIDE COUNTS FOR POINTS AND MILEAGE. Show up a little early for complimentary coffee and a stretch session with certified yoga instructors from YOGA DEN World Golf Village! The yoga studio will be open at 7:45 AM for a 15-minute warm up. Coffee will be provided! 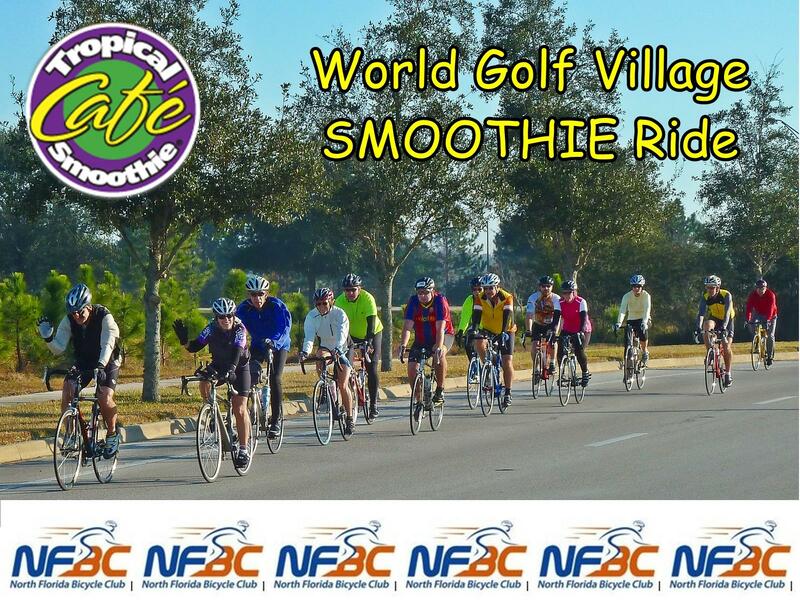 After the ride join other riders at the TROPICAL SMOOTHIE CAFE for a smoothie, sandwich or some coffee. Or, stick around for a complimentary post-ride stretch session with certified yoga instructors from YOGA DEN World Golf Village! Stretching will be outside (weather permitting) next to the Tropical Smoothie so you can enjoy a post-ride refreshment and give your tired muscles a much needed recovery stretch! 15-20 minute stretch sessions will be staggered between 10:45-11:45 AM, so finish with your normal pace group and meet us near Tropical Smoothie!